What’s the Best Tool to Use for Reciprocating Blades? 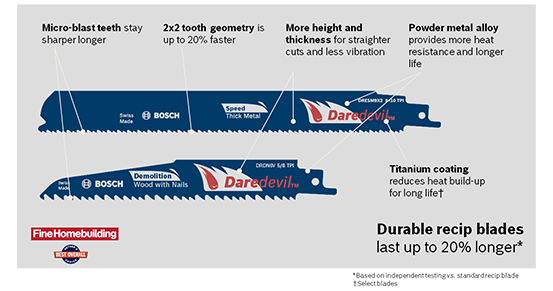 Reciprocating saws (sawzalls) are the only tool for which recip blade can be used. Larger, higher amperage saws are needed for demolition jobs. We recommend using a Bosch 1-1/8″ Reciprocating Saw for regular applications and a Compact Demolition Reciprocating Saw or 1-1/8″ Vibration Control™ Reciprocating Saw for demolition projects. Common Material to Cut with Reciprocating Saw Blades. Tips and Tricks the Pros Know. TPI (teeth per inch). Lower TPI results in a faster, rougher cut. Higher TPI results in a cleaner cut. Variable tooth pitch has teeth that change along the length of the blade allow both faster and cleaner cuts. Bosch 2×2 tooth geometry has alternating heights on pairs of teeth for up to 20% faster material removal. As a general rule of thumb, you need at least two teeth in the material at all times and three is better. Gullet-space between each tooth. The gullet collects and clears out the material being cut. Deep gullets clear material more efficiently than shallow gullets. Blade shapes – taper and non-taper. Taper-blades are designed for plunge cutting, curve cuts and easier starts in hard-to-reach application. Kerf – body thickness. Thin-kerf blades offer faster cutting and flexibility for flush cutting. Thicker-kerf blades offer straight, more stable cutting. Reinforced tooth – wide tooth base with a smaller gullet. Progressor reciprocating saw blades are two blades in one. They can cut thin material with their small teeth in the back and thick material with the large teeth on the front. It has an exaggerated tip for easier plunge cutting and a taper-back body for easier starts in hard-to-reach applications.